When we were asked to produce a pyromusical fireworks display for Nadia and Eric’s Wedding we jumped at the chance! 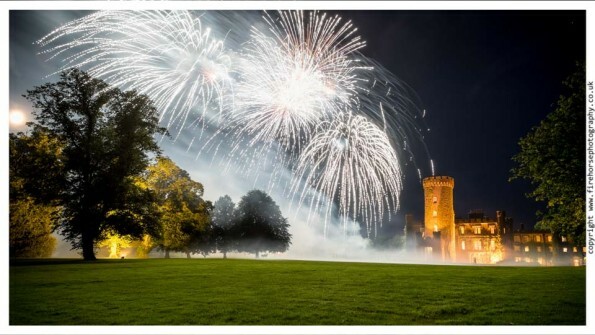 Then we found out the venue was the fabulous Swinton Park near Masham and were truly delighted to be creating a fantastic fireworks display at one of the very finest venues in Yorkshire. Swinton Park is home of not only a great venue but also the home of many friendly deer who live in the deer park in front of the main house. We had a few confused faces whilst setting up, but these are not just any deer, they are firework deer. For those interested, you can even hire out a small Deerhouse for an intimate meal whilst they meander around you in the parkland! Nadia and Eric got in touch with us through a recommendation. Much of the wedding fireworks work we do at Sirotechnics is based on word of mouth and recommendation from previous customers. The brief was to create a 4 minute pyromusical display, with a big ending and 2 rather different tracks. The tracks were chosen by the couple and digitally remastered down into two slightly shorter versions to fit the timeframe. Work then began on design and of course the big ending! If you’re thinking of getting married and having fantastic fireworks at Swinton Park, get in touch and let’s see what we can do for you in this absolutely fabulous setting.